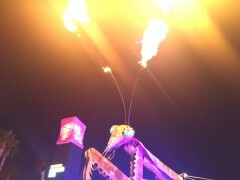 "Welcome to Downtown Las Vegas," a jovial Reid said at an evening news conference at Container Park, where a 40-foot Flaming Praying Mantis shoots 50 gallons of propane-fueled fires out of its antennae every evening. Neither Reid nor the state&apos;s most powerful labor group, the local Culinary Union which represents hotel and casino workers, endorsed a candidate in the 2016 contest. But after the race tightened in the past few weeks into a dead heat between Clinton and Sanders, Reid flexed his political muscle. Nine days before the caucus, Catherine Cortez Masto —the Democrat whom Reid has endorsed to replace him in the November election — announced her support for Clinton. Then last week, the senator called the head of the Culinary Union to encourage its workers to carve out time enough to caucus along the six precinct sites set up for such workers along the Strip, as The New York Times reported . Those precincts voted heavily for Clinton, helping secure her 53-47 victory over Sanders. "I did everything I could to turn out the vote," Reid said Saturday night, denying that he put his finger on the scale for either candidate. "Now some say, &apos;Oh, heavy turnout? That helps Bernie.&apos; Others say, &apos;If you have the hotels heavily involved, that favors Clinton.&apos; Back and forth. "I did what I thought was best for the state of Nevada and the country. I worked hard to make sure that turnout was as good as we could get it, all right? I don&apos;t think that I favored either party. In fact, at the town hall meeting we had the other day, I was hugged by Bernie&apos;s wife who said, &apos;Thanks for not endorsing.&apos;"
While turnout fell well short of 2008&apos;s approximately 117,000 caucus-goers, Reid said he was pleased with it and its relatively smooth operation, despite long waits at some caucus precincts, including Reid&apos;s . Democratic officials estimated statewide turnout would be around 80,000. Republicans hold caucuses Tuesday, but have typically seen fewer voters than Democrats. Saturday&apos;s turnout and Clinton&apos;s win also swatted down a narrative Republicans had been pushing that, although the retiring senator had not endorsed in the race, Reid was putting his political muscle behind Clinton, and that a loss for her meant trouble for him and for this fall&apos;s Senate race to replace him. Masto, the state’s former attorney general whose campaign has deep ties to Reid, campaigned for Clinton, praising her as the “champion Nevadans need” in the White House. “If Hillary loses, or ends up in another Iowa-type situation, that’s not only a ding on Masto, but would call into question the efficacy of the entire Reid machine,” one Republican operative said Friday. A Democratic strategist not involved in the party’s primary but working on the presidential race said it was “tough to say” whether Clinton’s victory could be attributed to the strength of the Reid machine. “They’re killers, but I truly believe that he cared about turnout, first,” the operative said. High turnout, if it continues, is “good for Masto in the fall,” the operative added. Reid had a lot to smile about. The first-in-the-West caucus is a part of his legacy, a premier spot on the political calendar whose establishment represents a capstone to his nearly 50-year career in public service. Reid has criticized the influence that Iowa and New Hampshire have in the process with their early caucus and primary, respectively, and has held up Nevada as a better representative of the nation as a whole. And he has been unabashed about his desire to register as many Democrats as possible during the caucuses, which would help his party come November. Nevada is now a perennial swing state at the presidential level, it has an open Senate race, courtesy of Reid&apos;s impending retirement, and Democrats are targeting two congressional seats and trying to take back majorities in the state Assembly. "I was very concerned it would turn out OK ," he said. "The setting here is much different than it was eight years ago," he added, citing the historic nature of the candidacies of President Barack Obama and Clinton drove up turnout, as did concern over the recession that hit Nevada hard. Still, he said, "I&apos;m satisfied with how the caucuses turned out. It was good for both candidates, and that was my concern. ... It&apos;s all over with. I&apos;m very happy." Reid also said he would endorse soon now that the caucuses were over. "Yeah, I&apos;m going to make an endorsement. I&apos;m not going to do it now. But, I&apos;ll go back to Washington. I&apos;ll make it fairly soon," he said. Asked why he was waiting to make his endorsement for his return to Washington, Reid let out a chuckle and said, "Don&apos;t you think you have enough news for tonight?" Ever the cheerleader for his home state, Reid signed off the news conference telling everybody assembled, "Glad you&apos;re in Nevada. Enjoy the state," Reid said, adding for good measure, "Sure is a lot more fun here than in South Carolina." The Nevada Senate race is rated a Tossup by the Rothenberg & Gonzales Political Report/Roll Call. Yokley reported from Washington. Contact him at EliYokley@RollCall.com and on Twitter @EYokley.